Introduction: Although NOTES peritoneoscopy has been widely performed, the image quality acquired with flexible endoscopes has never been directly compared with the current gold standard of the rigid laparoscope. The purpose of the current study was to assess and compare the image quality derived from the flexible endoscope versus the rigid laparoscope during exploratory peritoneoscopy. Methods: Adult swine (n=2) underwent exploratory peritoneoscopy performed with two different camera sources; 1) standard 30-degree angled Stryker laparoscope and 2) Fuji EN-410WM5/23 flexible enteroscope. The scopes were introduced into the peritoneal cavity through a 12 mm laparoscopic port; two 5 mm ports were place for organ manipulation. The exploratory peritoneoscopy was performed with each camera source in similar fashion with systematic evaluation of the peritoneal surface, spleen, diaphragm, stomach, liver, gallbladder and pelvic structures. The images were captured electronically and then analyzed and graded in a blinded fashion using a digital image quality assessment and comparison scale for peritoneoscopy (DIQACSP) developed by our group. 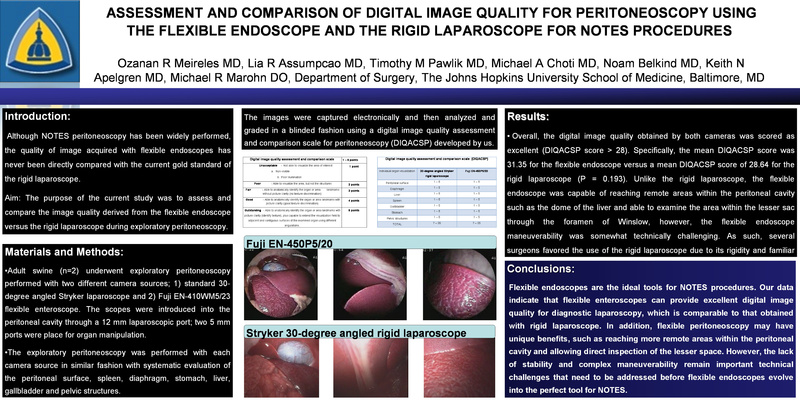 Results: Overall, the digital image quality obtained by both cameras was scored as excellent (DIQACSP score > 28). Specifically, the mean DIQACSP score was 31.35 for the flexible endoscope versus a mean DIQACSP score of 28.64 for the rigid laparoscope (P = 0.193). Unlike the rigid laparoscope, the flexible endoscope was capable of reaching remote areas within the peritoneal cavity such as the dome of the liver and able to examine the area within the lesser sac through the foramen of Winslow, however, the flexible endoscope maneuverability was somewhat technically challenging. As such, several surgeons favored the use of the rigid laparoscope due to its rigidity and familiar lenses angulation. Conclusion: Flexible endoscopes are the ideal tools for NOTES procedures. Our data indicate that flexible enteroscopes can provide excellent digital image quality for diagnostic peritoneoscopy, which is comparable to that obtained with rigid laparoscope. In addition, flexible peritoneoscopy may have unique benefits, such as reaching more remote areas within the peritoneal cavity and allowing direct inspection of the lesser space. However, the lack of stability and complex maneuverability remain important technical challenges that need to be addressed before flexible endoscopes evolve into the perfect tool for NOTES.